Sophisticated bayfront residence with gorgeous water views overlooking Venetian Bay. 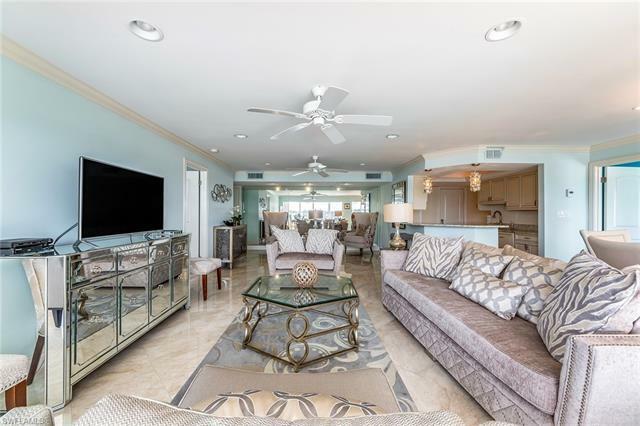 Move-in ready, beautifully updated and turnkey furnished 2-bedroom, 2-bath condominium in the heart of Venetian Village. Crown molding, marble flooring, granite countertops, updated baths, washer & dryer, Plantation shutters, walk-in closets, top-of-the-line appliances, and new flooring. Residents enjoy fabulous amenities including a fitness room, sauna, BBQ area, community room with kitchen and more. Lovely glass/screened lanai for additional living space with tranquil water views. Under building parking and extra storage. Boating enthusiasts will enjoy the boat docks at your backdoor, available for lease with Gulf access. Madrid Club is walking distance to Venetian Village to enjoy restaurants and upscale shopping and minutes to downtown Naples. Beach access is across the street to take in fabulous sunsets. Live the true Naples lifestyle.